One of the best ways to understand a place, is to understand its shops. The shops tell you what’s important to the people who live in that place. Where I live now, my local shop is part of the Costcutter franchise. Inside, you find all the things you’d normally expect in a local shop – milk, bread, jam, cucumbers, peppers, salt, a range of detergents, olive oil, dustpans and brushes, tea. Things like that. Things people need in their day to day. Tellingly, in the fridges you also find a lot of halloumi, feta cheese, Cypriot yoghurt. It tells you what people in the area are like, what they want, what they need, what they like to spend their money on. I used to live in Finsbury Park, a place in north London. As I’d make my way around the area – whether it was going to buy milk or tea or jam, or going to a pub or getting a haircut or going to meet someone or anything like that, I would often walk down Stroud Green Road, which starts just by Finsbury Park station and goes west to Crouch End. One shop on that road – in fact it’s a series of shops on both sides of the road which has expanded and absorbed four or five storefronts on the street – is a place called Pak’s. Pak’s is a chain of cosmetics stores founded in Finsbury Park (there’s an outlet where I live now, too). With names like Wig World and Hair Centre, it’s pretty obvious what they’re all about. Step in from the street and you find shelves of mannequin heads lining the walls. 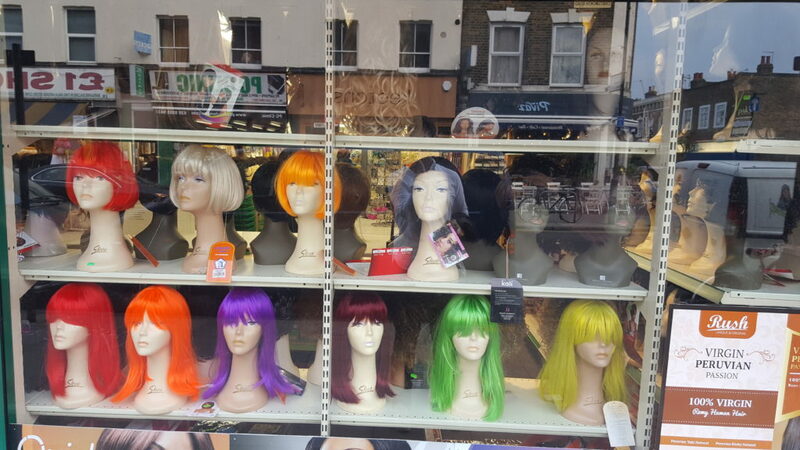 Empty faced, they wear a huge array of black, brunette, blonde and multi-coloured wigs of every length and tone. Aimed primarily at a black clientele, the stores sell real and synthetic wigs, relaxers, extensions, shampoos and pretty much any other product you could possibly want. 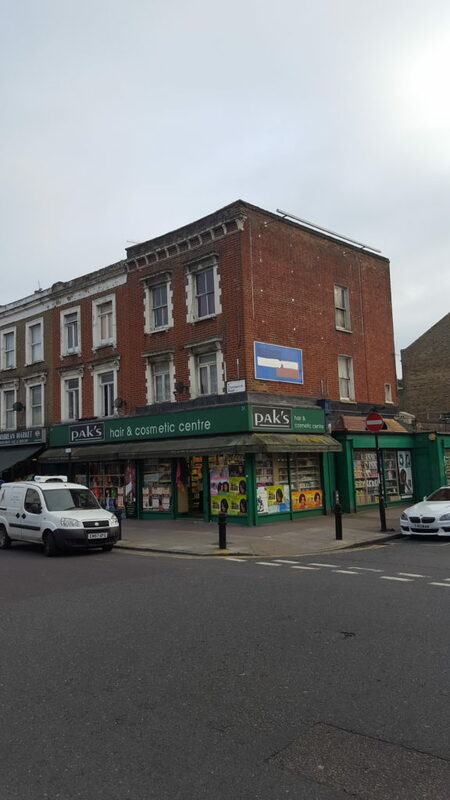 Officially established on Stroud Green Road in the 1990s, Pak’s has gone on to become a nationwide brand, with 35 outlets across London and the UK, become a provider to major supermarkets and an exporter of hair products to mainland Europe. You can guess a lot about Finsbury Park from the fact that Pak’s (and quite a few other stores doing similar things) line Stroud Green Road. But you can understand even better by finding out how it got there. “There’s a lot of heritage around this area” explained Peter Mudahy, CEO of Pak’s, when I asked him. “For a long time, Blackstock Road (which connects to the bottom of Stroud Green Road) was a very black-populated area. Back then you would have a lot of black barber shops where people would come from all over to get their afros done and shaped and all that. Again, the Aquarius Salon on Stroud Green Road has a lot of history from back in those days”. Pak’s in its present incarnation has only existed for just over 20 years, but it emerged out of a much older series of developments. “It originated from when people began coming over in the 1950s – from Jamaica, Trinidad, Barbados. They would come up to Finsbury Park to buy fruit and veg from home – bananas and yams and what-have-you”. Mr Mudahy explains that the area was something of a hub for the needs of the Caribbean community in London and beyond. “You used to have coach trips with people coming down from Bristol, Birmingham, Manchester, and buying food on Blackstock Road, going to Monsell Road for fashion and coming up to Stroud Green Road for cosmetics”. Their sales people took an innovative approach. My Mudahy explains that they visited Caribbean fruit and vegetable stores in different areas of London such as Brixton, Dalston and Finsbury Park; all areas with large Caribbean communities. Pak’s was originally a fruit and vegetables grocery store, importing produce from the tropics. If you wander further up Stroud Green road, you’ll still come across shops selling coconuts, yams, allspice, banana chips, salted cod, sugar cane, scotch bonnet peppers. Things like that. Pak’s began selling hair products as a side business, but eventually decided to go all-in with the cosmetics, and hasn’t looked back since. The industry for Afro-Caribbean cosmetics is expected to reach £475 million by 2017, and new lines from industry giants such as L’Oréal are feeding already high demand. However, the chain’s traditional customer base is apparently on the decline. “Our target demographic has actually diluted somewhat because it’s becoming increasingly integrated with the Caucasian population”. The Caribbean, and British-born Caribbean population in the UK is just under 600,000 – plus another 400,000 who identify as mixed Caucasian and Black Caribbean according to the last census. “The Caribbean population is so integrated with the Caucasian population the market is shrinking” says My Mudahy. However, the business is adapting – he explains that the store is now catering to a much more diverse market – “anyone with curly hair” – including Africans from all over the continent, Brazilians, French, Portuguese and more. Another change facing the business is trend setting. As with most industries, the Internet has radically changed how companies market their products and influence tastes. Mr Mudahy sums it up as such: “bloggers, bloggers, bloggers”. The industry is now primarily led by the Internet with “hype about a beauty product on social media becoming much more important than a celebrity endorsement”. A quick venture into the world of beauty and cosmetics blogging confirms just how big the Internet hype machine has become. If Mr Mudahy’s business is changing, so are the streets around Finsbury Park station. Once dominated by Caribbean stores, there’s a whole new clientele and a whole load of new businesses meeting their needs today. On Fonthill Road, parallel to Stroud Green Road, are fashion stores aimed at Nigerian customers and general corner shops run by Turks. Blackstock Road is now more remarkable for its Eritrean restaurants and Algerian butchers and Stroud Green road is an eclectic mix of Pakistani grocers, Spanish tapas bars and Korean dining. Whenever I’m back in Finsbury Park – maybe to meet someone, or to catch a bus, or go to one of its pubs or go to a vegetarian Indian restaurant I like – I’m always glad to see Pak’s. The way it still dominates the bottom of Stroud Green road with its loud green logo. And even though I’ve never had any need to shop there, I think I like it because of what it says about that place, and what its shops can tell you about it, and what the people there value. Nice job mate, this is really interesting!